Subpage of Kowalski/cf, recovered from archive. 419 A New Kind of Nuclear Reactor? Consider a short sealed porcelain tube, containing about one gram of white powdered LiAlH4 fuel mixed with ten grams of powdered nickel. Professor Alexander G. Parkhomov, who designed and tested it, calls this small device a nuclear reactor, in a published report. The purpose of this short article is to briefly summarize Parkhomov’s discovery, in as simple a way as possible, and to make some general comments. Such setup, even if scaled up, would not be useful in an industrial electric power generating plant, due to well-known conversion efficiency limit. The expected readers are scientists and educated laymen. Consider a sealed porcelain tube 20 cm long, containing about one gram of white powdered fuel mixed with ten grams of powered nickel. Professor Alexander G. Parkhomov, who designed and tested it, calls this small device a nuclear reactor, in a published report (1). The purpose of this short article is to briefly summarize Parkhomov’s discovery, in as simple a way as possible, and to make some general comments. The expected readers are scientists and educated laymen. Hopefully, this article will prepare them to understand Parkhomov’s report, and similar technical publications on the same topic. The author, a retired nuclear physicist educated in the USSR, Poland, France and the USA, has dedicated this article to his father who died in a Gulag camp, and to his famous mentor Frederic Joliot-Curie. Who is Alexander Parkhomov? 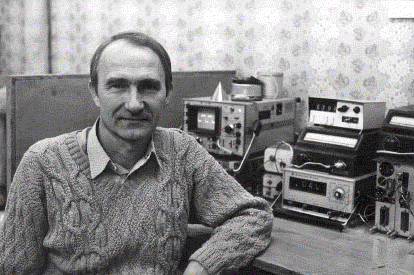 He is a Russian scientist and engineer, the author of over one hundred publications. The photo shown below was taken in 1990. Electronic equipment on the table is probably not very different from what he used to measure thermal energy released in the reactor. The title of Parkhomov’s recent report is “A Study of an Analog of Rossi’s High Temperature Generator.” Is the word “reactor,” in the title of this section, appropriate? Yes, it is. A totally unexplained reaction, releasing an extraordinary amount of heat, must be responsible for what is described in Sections 3. Is this reaction nuclear? Parkhomov certainly thinks so; otherwise he would not use instruments designed to detect nuclear radiations. His powdered fuel was 90% natural Ni; the rest was a LiAlH4 compound. The controversial field of science and technology (2,3), in which Rossi (4) and Parkhomov are active, is Cold Fusion CF), also known under different names, such as CMNS, LENR, etc. Reference to Andrea Rossi in the title of the report is puzzling. Yes, Rossi also thought that thermal energy released in his device was nuclear, rather than chemical. But that is where the similarities end; the two reactors differ in many ways. For example, Rossi’s fuel was hydrogen gas, delivered from an outside bottle. The illustration below is a simplified diagram of Parkhomov’s setup. The diagram does not show that the porcelain tube (red in the diagram) was closely wrapped by a heating wire. The electric energy delivered to the heater, in each experiment, was measured using several instruments; one of them was a standard kWh meter, similar to those used by electric companies. 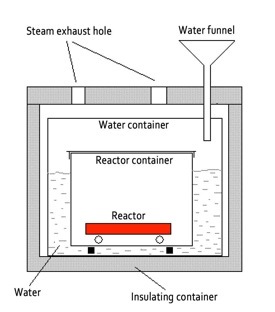 Heating of the fuel was necessary to keep the fuel temperature very high; the required temperature had to be between 1000 C and 1400 C.
The reactor container (a covered box) was immersed in an aquarium-like vessel, filled with boiling and steaming water. To keep the water level constant during the experiment, a small amount of hot water (probably 90 grams) was added through a funnel, every three minutes or so. The mass of the escaped steam, turned into liquid water, was measured outside of the setup. Knowing the mass of the steam that escaped during an experiment one can calculate the amount of thermal energy escaping from the aquarium. Parkhomov’s method of measuring excess heat was not very different from that used by the leader of Russian Cold Fusion researchers, Yuri Nikolaevich Bazhutov (5). Let XH be the amount of heat the aquarium water received from the reactor that is from the porcelain tube containing the fuel. It represents thermal energy received by water, during the experiment. OUTPUT = 2260*1.2 = 2712 kJ. XH = 2712 – 823 = 1889 kJ. The unfortunate term “cold fusion” was imposed on them. Why unfortunate? Because it created the unjustified impression that cold fusion is similar to the well known hot fusion, except that it takes place at much lower temperatures. This conflicted with what had already been known–the probability of nuclear fusion of two heavy hydrogen ions is negligible, except at stellar temperatures (6,7). Suppose the discovery had not been named cold fusion; suppose it had been named “anomalous electrolysis.” Such a report would not have led to a sensational press conference; it would have been made in the form of an ordinary peer review publication. Only electrochemists would have been aware of the claim; they would have tried to either confirm or refute it. The issue of “how to explain the heat” would have been addressed later, if the reported phenomenon were recognized as reproducible-on-demand. But that is not what happened. Instead of focusing on experimental data (in the area in which F&P were recognized authorities) most critics focused on the disagreements with the suggested theory. Interpretational mistakes were quickly recognized and this contributed to the skepticism toward the experimental data. The prototype of an industrial nuclear reactor was built in 1942 by Enrico Fermi. It had to be improved and developed in order to “teach us” how to design much larger useful devices. The same would be expected to happen to the tiny Parkhomov’s device. a) One task would be to develop reactors able to operate reliably for at least 40 months, instead of only 40 minutes. This would call for developing new heat-resisting materials. Another task would be to replace the presently used (LiAlH4 + Ni) powder by a fuel in which energy multiplication would take place at temperatures significantly lower than today’s minimum, which is close to 1000 C .
b) The third task would be to scale up the setup, for example, by placing one hundred tubes, instead of only one, into a larger aquarium-like container. This would indeed increase the amount of released thermal energy by two orders of magnitude. Scaling up, however, would not increase the multiplication factor. The only conceivable way to increase the MF would be to find a more effective fuel. c) A typical nuclear power plant is a setup in which a nuclear energy multiplier (a uranium-based reactor) feeds thermal energy into a traditional heat-into-electricity convertor. Such multipliers are workhorses of modern industry. Note that MF of an industrial nuclear reactor must be larger than three; otherwise it would not be economically justifiable. This is a well-known fact, related to the limited efficiency of heat engines. d) Uranium and thorium seem to be the only suitable fuels, in any kind of energy multiplier. Why is it so? Because fission is the only known process in which more than 100 MeV of nuclear energy is released, per event. This number is about four times higher than what is released when two deuterons fuse, producing helium. Will more efficient fuels be found? If not then chances for replacing coal, oil, and gas by a Parkhomov-like fuels are minimal, except in heating applications. Science is at the base of all modern engineering applications. But the main preoccupation of most scientists is to understand laws of nature, not to build practically useful gadgets. Confirmation of claims made by Parkhomov is likely to trigger an avalanche of scientific investigations, both theoretical and experimental, even if the energy multiplication factor remains low. a) Suppose that Parkhomov’s energy multiplier, described in this article, is already recognized as reproducible on demand, at relatively low cost. Suppose that the “what’s next?” question is asked again, after two or three years of organized investigations. Scientists would want to successfully identify a “mystery process” taking place in the white powder, inside the porcelain tube. Is it chemical, magnetic, pyrometallurgic, biological, nuclear, or something else? Answering such questions, they would say, is our primary obligation, both to us and to society. b) Parkhomov certainly believes that a nuclear process is responsible for XH, in his multiplier. Otherwise he would not use instruments designed to monitor neutrons and gamma rays. But, unlike Fleischmann and Pons, he does not speculate on what nuclear reaction it might be. He is certainly aware of tragic consequences of premature speculations of that kind. The social aspect of Cold Fusion was also debated on an Internet forum for CMNR researchers. Referring to the ongoing CF controversy, X1 wrote: “The long-lasting CF episode is a social situation in which the self-correcting process of scientific development did not work in the expected way. To what extent was this due to extreme difficulties in making progress in the new area, rather than to negative effects of competition, greed, jealousy, and other ‘human nature’ factors? “A future historian of science may well ask “how is it that the controversy ignited in 1989 remained unresolved for so many decades? 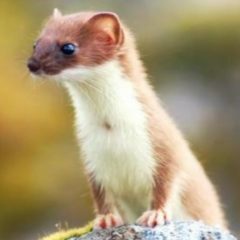 –who was mainly responsible for this scientific tragedy of the century, scientists or political leaders of scientific establishment, and govrnment agenies, such as NSF and DOE? Discrimination against CF was not based on highly reproducible eperimental data; it was based on the fact that no acceptbal theory was found to explain unextected experimental facts, reported by CF researchers. Parkhomov’s experimental results will most likely be examined in many laboratories. Are they reproducible? A clear yes-or-no answer to this question is urgently needed, for the benefit of all. What would be the most effective way to speed up the process of getting the answer, after a very detailed description of the reactor (and measurements performed) is released by Parkhomov? The first step, ideally, would be to encourage qualified scientists to examine that description, and to ask questions. The next step would be to agree on the protocol (step-by-step instructions) for potential replicators. Agencies whose responsibility is to use tax money wisely, such as DOE in the USA, and CERN in Europe, should organize and support replications. Replicators would make their results available to all who are interested, via existing channels of communication, such as journals, conferences, etc. A well-organized approach would probably yield the answer in five years, or sooner. (7) Edmund Storms, “The Explanation of Low Energy Nuclear Reaction,” Infinite Energy Press, 2014. This website contains other cold fusion items.